Post 93 represents the 29th Division Association in Connecticut, Maine, Massachusetts, New Hampshire, New York, Rhode Island and Vermont. However, our membership also crosses borders and oceans. Post members include those from Canada, France, the Netherlands and the United Kingdom. Veterans from World War II and those with more recent service are represented, along with many children and grandchildren of 29ers who served. Members of Post 93 meet twice a year for luncheon meetings, in the spring and fall. Post 93 member Mike van den Dobbelsteen and his wife Deborah live at Le Pont de la Pierre in Saint Clair sur l’Elle in Normandy. The bridge across the river Elle next to their house was an objective for the 115th Infantry Regiment and the area was the scene of a battle on 12 June 1944 which resulted in roughly 90 casualties among the 1st Battalion troops. 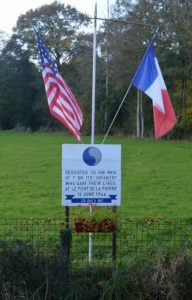 In honor of those men who paid the ultimate sacrifice, Deborah and Mike erected a monument on their land close to the bridge. Of the 17 men who were killed that day, six are buried at the Normandy American Cemetery. At the American cemetery, they have adopted the graves of Glen J. Stevens (A/115, killed on 11 July 1944) and Victor P. Zorman (B/115, killed 31 July 1944). Vice- Commander — Carl Yusna, Jr.
Dues: Yearly Dues for 2019 are $25.00. However, veterans’ dues are $15 and World War II vets pay nothing. If you wish to pay for both 2019 & 2020, we are offering a discount: $25 for veterans and $45 for everyone else. Dues may be paid electronically at the PayPal link below or mailed to the address above. If you pay your dues via PayPal, please add $.50 (the cost of a stamp) to your dues to help with the processing fee we are charged by PayPal. Be sure to include your NAME and POST 93 in the description field.